A Dutch friend of mine once said he was appalled that Americans eat corn on-the-cob. “That’s what pigs eat,” he said. If that’s true, Dutch pigs must be happy pigs, because there’s nothing tastier ear of sweet summer corn slathered in butter and salt. Oink, oink. 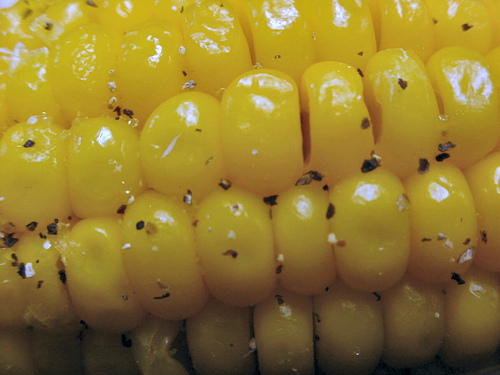 Summer means sweet corn and cheap corn. My parents would buy it by the bushels in August and my dad would boil it, cut it from the cob, and freeze it. We ate like it was summer until November, about the time my Dad would announce we were eating the last bag. We savored the buttery sweetness, knowing we wouldn’t experience it for another nine months. Boil the corn for 5 to 7 minutes. Cool and cut kernels from the cob. Drain and rinse beans. Whisk dressing ingredients and toss beans and corn with dressing and remaining ingredients. Serve over romaine or alone with warm quesadilla or corn tortillas, or with tortilla chips as an appetizer.